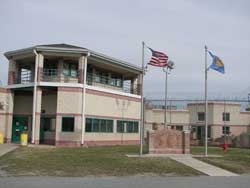 Sussex Correctional Institution is located in Georgetown Delaware. It houses various custody levels from minimum to maximum security inmates. The current capacity for this facility is a little over 1,200 inmates. Educational, Vocational and work programs are available to inmates incarcerated at this facility. A substance abuse treatment program called KEY is therapeutic approach towards conquering substance dependancies. You must have an approved visiting application on file to visit an inmate and you must schedule your visit at least one week in advance by calling (302)-856-5545 Monday-Saturday 9am-3pm, or 4:30pm-11pm. All visitors must report 30 minutes in advance of their scheduled visiting time to ensure they are admitted to visitation.